Entries from Digital Intelligence tagged with "bbc iplayer"
BBC Three will go online-only in February next year, with the broadcaster accepting that long-term future of broadcasting "seems likely to be online”. Nearly 65 million people around the world are bypassing internet restrictions to watch the BBC’s shows online, according to new research. The BBC has partnered with tech firm This Place, to develop a way people can select programmes using a cheap, brainwave-reading headset. The BBC has unveiled an update to its on-demand iPlayer service, which will include new online-only shows for "a BBC Three audience", as the broadcaster looks to emulate the success of Netflix. The number of people watching and listening to BBC programmes on iPlayer via mobile phones and tablets has reached an all-time high, and is now almost level with the desktop audience, according to new data. The BBC's director general Tony Hall is expected to announce the launch of the next generation BBC iPlayer in a keynote speech today. New figures show that TV viewing in the UK is continuing to expand as people watch additional TV on-demand via TV sets, tablets, smartphones and laptops. In total, the average UK viewer watched 4 hours, 4 minutes of TV a day in 2012 – the year when TV in the UK became 100% digital following analogue switch-off. The BBC is to premiere 40 hours of content of its iPlayer service ahead on TV, as it looks to reposition itself as a leader in the digital market. 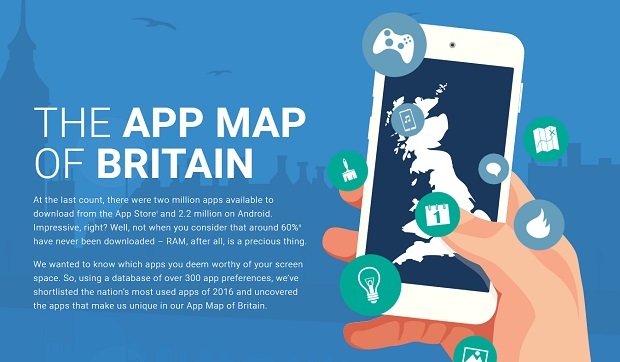 Over half of the UK (51%) prefer to watch catch-up services on a TV, rather than a smartphone or tablet. The BBC has launched 'iPlayer Radio' as part of an overhaul of its online audio content, splitting it from its TV content. The new service will see audio content taken out of the existing BBC iPlayer and instead offered as part of a separate service on desktop and mobile. The service will highlight snippets from BBC output, including associated video content. BT is to give away YouView digital boxes to people that sign up to its Infinity fibre broadband or TV Essential service, provided they pay a £50 activation charge plus delivery costs. The Humax YouView box will give access to free digital channels as well as pay per view from Sky and catch up and other video on-demand services. The offer will start in October. The BBC has updated its iPhone and iPad app, allowing mobile downloads as an alternative to streaming for the first time. Until now, programmes could only be downloaded to PCs and Macs for later viewing. The move opens up a new way for people to watch BBC content on the move. Starting this week on iPhone, iPad and iPod touch, users can download shows from BBC iPlayer over Wi-Fi in advance by adding them to a ‘download queue’. The opening ceremony of the Olympic Games has set the record for the most number of views in a single day on the BBC’s iPlayer catch-up platform. Originally aired on Friday night, the Danny Boyle-directed ceremony was requested on the iPlayer 925,000 times on Saturday, the BBC said. Over the course of the weekend, it was requested a total of 1.7 million times. Broadcaster BSkyB is to launch an online television service to non-Sky customers to combat a sharp slowdown in growth of its customer base. The channel will launch the online TV service in the first half of 2012, giving users access to Sky movies and eventually Sky Sports, on flexible tariffs, without signing a contract. The new Sky internet TV service will stream content to computers, tablets, mobile phones, games consoles and smart TVs. UK Internet users spend a combined total of 240 million hours every month watching online video content, with the average user spending 20 minutes a month watching YouTube, according to analysis from Experian Hitwise. The findings come from its new report, "Online Video: Bringing Social Media to Life" which outlines the latest consumer trends in this sector and advice for digital marketers. Channel 4's catchup service 4oD attracted 3.4 million viewers in July, according to figures released for the first time by the broadcaster this week. Popular Channel 4 shows including Hollyoaks and Eight Out of 10 Cats also drove an unspecified increase in 4oD programme views, to 29m in July. 4oD had 3.4 million average monthly viewers last month, according to the report, with Sirens and Come Dine with Me among the most popular catchup programmes. Channel 4 is launching an iPhone version of its 4OD application, as the broadcaster ramps up its online and mobile services. The app, which has been available on the iPad since April, will be released for the iPhone and iPod touch in September to mark the launch of a revamped 4OD service. Users will have 30-day access to Channel 4 broadcasts, as well as archived episodes from shows such as The Inbetweeners and The IT Crowd. BBC Worldwide, the BBC’s commercial arm, is launching a global BBC iPlayer app in Europe, with a global roll out planned later in the year. This video on demand subscription service, launching first in Western Europe, will deliver BBC shows to viewers in 11 markets. For €6.99 a month (or €49.99 for an annual subscription), the app will initially be available in Austria, Belgium, France, Germany, Italy, Luxembourg, The Republic of Ireland, The Netherlands, Portugal, Spain and Switzerland. 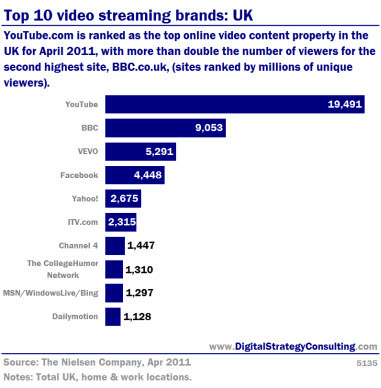 YouTube is ranked as the top online video content property in the Uk for April 2011, with more than double the number of viewers for the second highest site, BBC (sites ranked by millions of viewers). The BBC has released free, standalone iPlayer apps for iPad and Android, with plans to launch a subscription-based version in the US in April. The iPad edition features a more suitable, tablet-sized layout than its web-app predecessor. The app includes panels for featured and most popular shows, a "For You" page that finds programmes the viewer might like based on previous viewings, channel or station guide layout, a vast array of categories and a search bar.